Everyone connected with this film has disavowed it except the producers who cut up Paul Schrader's film and released it on their own. I went in not sure what to think and very curious if it was the disaster Schrader and the cast made it out to be. 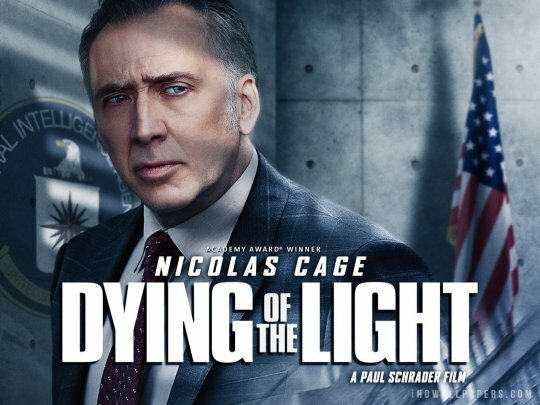 The plot has Nick Cage as CIA desk jockey who was once a field operative who was bruised and beaten a terrorist who captured him. Decades later he learns that the terrorist is not dead as he believed but very much alive. Cage then decides to go rogue and hunt his tormentor and kill him. In its current form DYING OF THE LIGHT is an interesting misfire that makes you wonder what Schrader's cut would be like. While nowhere near the disaster that some reviews made it out to be it is in fact a passable thriller. My one wild card in the mix is how Cage's impending dementia would have played in the directors cut since here it seems as if it was added for no real reason, the film would have worked without it. I have additional questions about whether the film would have been much better owning to the fact that Schraders previous film, The Canyons was a mess (then again he didn't write that).